Ready to enjoy a private resort environment to call your own? Then it’s time to Sea the Light. Located in the Villages of Ocean Hill, Sea the Light has everything you will ever need to pamper yourself while enjoying the best of the Northern Outer Banks. Located close to Wild Horse Tours, historic attractions, and the brilliant Atlantic Ocean just a 5 minute walk away, this 6 bedroom, 4.5 bathroom sandcastle is poised for every type of adventure under the sun. Take a break from surfing and sightseeing, and enjoy your private outdoor oasis at home, starting with a dip in the refreshing private pool. Featuring ample deck space, a privacy fence that’s bordered by towering native trees, a picnic and grill area, and a relaxing hot tub that’s just steps away, the pool area will be a favorite destination for vacationers of all ages and tastes. After a beach trip or a little time poolside, step inside and keep the fun going in the ground level game room, which features a pool table, casual seating, Flat Screen TV, DVD, VCR, and a wet bar with microwave, mini-fridge, and ice machine for easy drink refills. There’s a laundry room and an adjoining full bath for added convenience, as well as a bedroom with two pyramid bunks that will be a hit with the kids. When it’s time to retire, head upstairs to the second level, where four bright and airy bedrooms can be found. Outfitted with touches of coastal decor, vacationers can take their pick of a bedroom with Queen Bed, Flat Screen TV, and DVD, a bedroom with Queen Bed, Flat Screen TV, and DVD/VCR, a bedroom with King Bed, Flat Screen TV, DVD/VCR, and deck access, or a Master Suite with King Bed, Flat Screen TV, DVD, and deck access. All of the bedrooms are inviting private havens, and guests can catch glimpses of the Currituck Lighthouse by stepping outside to the covered deck. The top level will be a favorite gathering spot at the end of busy explorations and beach days, thanks to a grand great room that has ample space for everyone in the family. The beautifully appointed dining area is framed by light-filled windows and elegant decor, while the kitchen will be an inspiration for any family chef, thanks to stainless steel appliances and a posh adjacent breakfast bar. Settle into the living area with gas fireplace, 2 sofas, a recliner, and Flat Screen TV &, DVD for evening relaxation, or retire to the generous master suite with King Bed, Flat Screen TV, DVD/VCR, and private bath. Outside, the sea breezes are waiting from the ample deck that also boasts scenic lighthouse vistas. 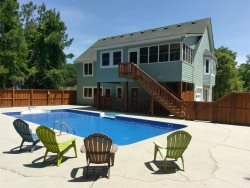 This bright vacation rental has all the amenities to keep families entertained, which fits in perfectly with the stellar locale that’s in the heart of prestigious Corolla. From the cool decks that are outfitted with rocking chairs and a comfy hammock, to the elite stylish furnishings and decor that creates a warm and welcoming space, a vacation at the lustrous Sea the Light is always a bright idea. RVs and campers are not permitted at the property. Beach access located on Bismark Dr. 0.3 miles from the property. For more pool information, please click here.